Im in awe of seeping intelligence... I often imagine whilst conversing with a uniqely intelligent person that their heads explode and the brains splatter across the walls. How do they hold that much knowledge in the confines of a humble (or perhaps not so humble) package of grey matter encased by bone? Bit crude, but thats my brain! Thank you all, There is now a glimmer of light in the back of my cave. The 0.168 Volt or similar on a modern electronic digital display multimeter is normal for that instrument. 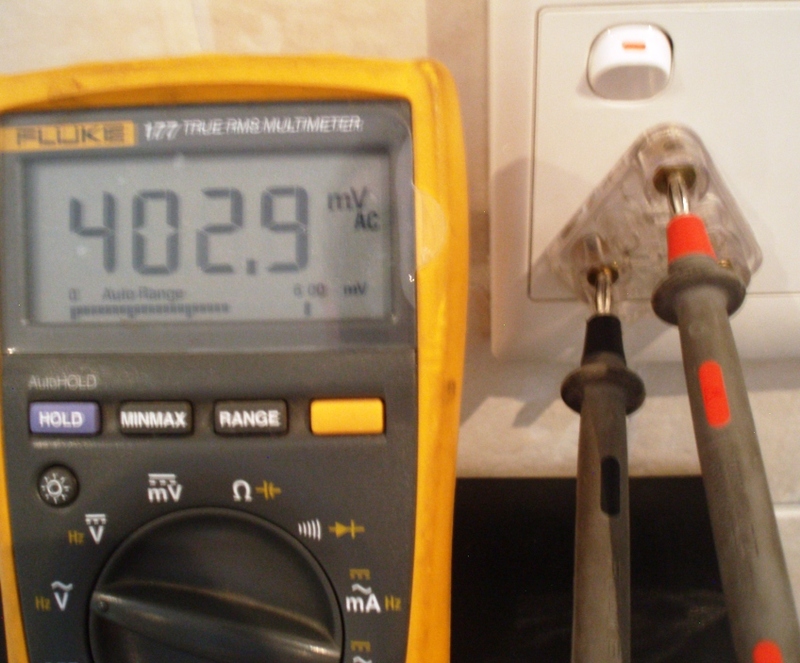 This is why aspirant electricians are first taught how to use and interpret a digital multimeter before using it. If you had used an old moving coil type multimeter you would have seen 0 Volt, as the above 220V scale would never allow you to read 0.172 Volt or similar. I can only assume that the measuring points were incorrect on the points you did not get the required results on or your technique was incorrect. Get any electrician to measure those points as I stated and you will get the results I stated. There is a vast difference in results if the experiment is performed incorrectly. You can be shocked by inserting a nail into the neutral socket with the plug switched off. My exact point in answering this post. The neutral is always at a 220V potential above earth if the power is supplied or if you earth yourself in any way. Eg. Standing in a pool of water or touching a brass window handle on a steel window frame. Or touching the earth socket on a plug. The exact reason the SA and British plugs have a barrier to inserting anything into the sockets. Never assume your earth leakage protection is working either. Also don't assume the wiring in your plug is correct. A fatal mistake for any electrician. The colour codes may be swapped. Try the experiment assuming the codes are incorrect. Never take anything at face value with electricity - always assume that it is deadly and check. The erroneous points 2 and 6 indicate incorrectly coded wiring or swapped live and neutral connection points. Another fact is that a meter never measures the highest value of the Voltage in the circuit. It measures the Root Mean Squared (RMS) voltage which is 0.707 of the peak voltage of the sine wave. Not so, as all four other readings agree, near enough, with what both your protocol and I said they should be. The neutral is always at a 220V potential above earth if the power is supplied or if you earth yourself in any way. Eg. Standing in a pool of water or touching a brass window handle on a steel window frame. Or touching the earth socket on a plug. Clearly, this isn’t true, since in both cases we measured a voltage of less than 0.3V between E and N.
Also don't assume the wiring in your plug is correct. Agreed—which is why we took all of the other measurements as well and reported them here. The erroneous points 2 and 6 indicate incorrectly coded wiring or swapped live and neutral connection points. Again, not true, since each of the other four measurements is in agreement with what we both claim they should be. I understand RMS quite well in the context of wave phenomena, among which are AC measurements and voltage/current specifications: You integrate the square of the voltage amplitude over a full wave period, divide by the length of that period, and take the square root of the result. For a sinusoidal wave as is AC, this works out at 1/√2 of the magnitude of the peak amplitude, and 1/√2 ≈ 0.707. If you have three-phase power in your home, the RMS voltage between any two of the three phases is nominally 380V, whereas it’s 220V between any one phase and neutral (380/220 is near enough a factor of √3, which also isn’t a coincidence). But this fact alone already seriously challenges the claim that “The neutral is always at a 220V potential above earth if the power is supplied…” since the three phases are shifted by 120° relative to each other. 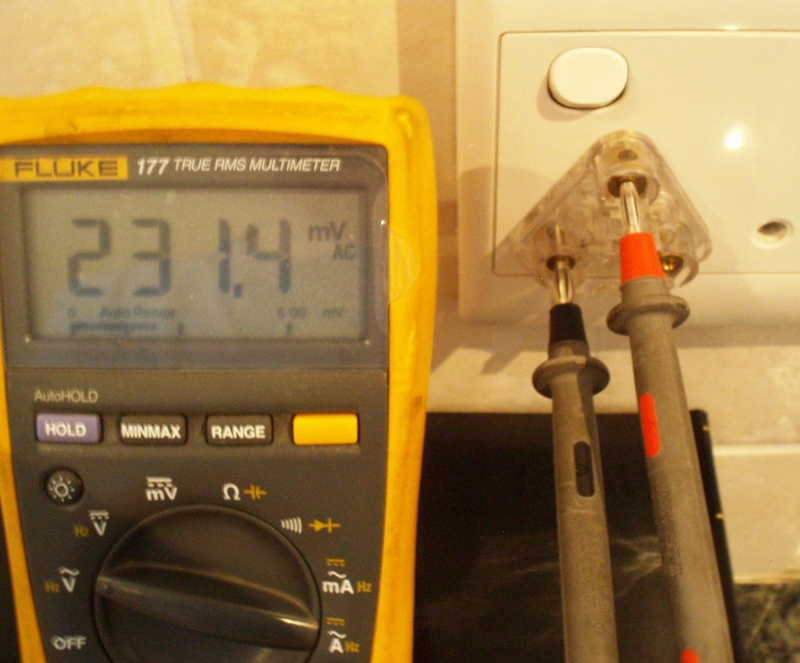 In each case, you can see whether the plug is switched on or off, which poles are being measured, and the reading on the multimeter’s display. It will be noted that the readings are in “mV” or millivolts; in volts, that’s the reading divided by 1,000. Consequently, I still remain at the point where I began. My suggestion in order to put this matter to rest is that some other forum regular performs these same measurements and then reports their findings here independently. Will someone please step up to the plug? I mean “plate.” Anyone? Please? You can be shocked by [...] Standing in a pool of water or touching a brass window handle on a steel window frame. ... sounds ludicrous. As even wikipedia states. Don't look at me to perform the said test. I cannot find my meter. It is well known that I need to go and buy a screwdriver or whatever every time I need one. Much easier and more cost-effective than to spend hours looking for one. The plug is of the new type, therefore the switch may be a double pole and it will isolate the neutral and live. All old plugs were single pole with the 220V potential neutral to the plug point. There is no way my colleagues and I were doing it wrong all these years. Also, your pics show the black lead on one point only. Try the other point and see. Double pole will find it dead too. Single pole will give 220V. But you have raised a very interesting point and I will be measuring some plugs in my 70 year old home with old style plugs tomorrow. I'll let you know how it goes. I will measure in the distribution board as well to confirm my readings. The neutral is connected to a bar there. It’s a single-pole switch, operating only the L connection. Would you like a photo of the disassembled wall socket? As I wrote before, the other four readings were in line with what was expected, so we didn’t bother taking any photos of those measurements. This means that with the switch in the “on” position, we measured 220V between N and L, and 220V between E and L. With the switch in the “off” position, we measured less than 1V between N and L, as well as between E and L.
Ground or earth in a mains (AC power) electrical wiring system is a conductor that provides a low-impedance path to the earth to prevent hazardous voltages from appearing on equipment (high voltage spikes). (The terms "ground" and "earth" are used synonymously here. "Ground" is more common in North American English, and "earth" is more common in British English.) Under normal conditions, a grounding conductor does not carry current. Grounding is an integral path for home wiring also because it causes circuit breakers to trip more quickly (ie, GFI), which is safer. Adding new grounds requires a qualified electrician with information particular to a power company distribution region. Neutral is a circuit conductor that normally carries current back to the source. Neutral is usually connected to ground (earth) at the main electrical panel, street drop, or meter, and also at the final step-down transformer of the supply. That is for simple single panel installations, for multiple panels the situation is more complex. The underlined bit means that an AC voltage of 220V between E and N will short-circuit at the point where E and N are connected to one another. What’s more, as an exercise in pure logic, the six measurements claimed simply can’t be true. Case 1 (switch off, VNE = 220V & VLE = 0V & VNL = 0V) implies that at least one of N, E or L’s potential depends on which pair is being measured. For example, if we accept that VNE = 220V and VLE = 0V are both true, then L and E must be at the same potential with N at a potential of +220V or –220V; however, this logical necessity contradicts the claim that VNL = 0V. Similarly, in case 2 (switch on, VNE = 220V & VLE = 220V & VNL = 220V) implies that at least one of N, E or L’s potential depends on which pair you’re measuring. For example, if we accept that VNE = 220V and VLE = 220V are both true, then N and L must either be at the same potential, or one of them is at +220V while the other is at –220V (i.e., they’re phase shifted by 180°). In turn, it follows necessarily that VNL is either 0V or 440V, which again contradicts the claim that VNL = 220V. All of that said, I still await BM’s results with keen interest. If I’m wrong, I will most seriously and urgently have to revisit my understanding of household AC electricity supply. Sorry Mefi I've been a bit swamped. Tonight pinky promise. Thanks, BM, much appreciated. So, bottom line is that your readings agree with ours. What many fail to remember is that the return conductor, the neutral, always has a voltage of 220V. But .... then surely no current would flow once the live wire is opened. (The potential difference between the live and neutral - each sitting at 220V relative to the ground if I read the statement correctly - would be zero or close to it.) This too little too late, of course, since the empiricists have already done their thing. True ... the buckets must move up and down together.